Ready to ditch your outdated bathroom for a new, relaxing spa-like one? Redesigning your bathroom can be a great way to update your home, but it can be a daunting task, especially considering space and cost constraints. 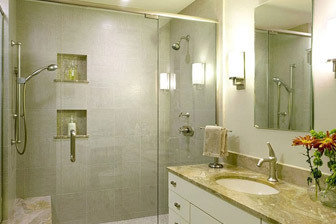 Here are nine tips that will help you accomplish a bathroom redesign easily. 1. Start with cosmetic improvements. Is it the old shag carpet, the shiny wallpaper or the ugly mirror that bother you the most? Cosmetic changes can be relatively easy and affordable to make. By repainting the bathroom a bright color and installing stick-on tile floor panels, you can have a new bathroom in no time for a fraction of the cost of a total overhaul. Sometimes your shower or sink can look brand-new with shiny new fixtures. Consider a massaging shower head for a spa-like shower experience. Always make sure to choose an energy-efficient model that has been certified by the EPA’s WaterSense program. Another quick way to update the bathroom is to add new hardware on the drawers and cabinets. 3. Determine what appliances you need. Is your bathtub taking up more room than it deserves, considering you hardly ever take a bath? Some bathrooms will seem far roomier if you only have a shower, or if you replace a built-in tub with a smaller, stand-alone model. And if you are constantly battling your partner when it’s tooth-brushing time, a double sink can change your life. 4. But don’t move them around. One way to keep costs down with a bathroom redesign is to keep the plumbing intact by putting your shower, tub, toilet and sink all in the same place they were. Feel free to upgrade the fixtures themselves, but keep the basic footprint the same. Always seek advice from a plumber before making any changes that could wreak havoc on your system. Similarly, stock cabinets are usually cheaper to buy than custom ones, so measure carefully and find a style that fits in the area you already have, to avoid extra construction work. Today’s bathroom counters and toilets are often a little higher than in the past. See if the one you are considering is a comfortable height before you buy it. Pedestal sinks might look charming, but they can be a pain when it comes time to store your extra toilet paper or hair products. A larger vanity with ample shelves and drawers can help you keep your items organized and your counters free of clutter. You also should consider adding a medicine cabinet over your sink or shelving over your toilet for extra storage space. If you want to keep extra towels handy, rolling them and placing them in a nice basket adds a fancy touch. Bathrooms often lack ventilation so a ceiling fan can help keep mold from growing in this steamy room. If you have a bathroom window, install shades that open from the top down so you can have the window open for fresh air while protecting your privacy. If you want your makeup to look natural, you’ll want to make sure your lights are bright enough to mimic sunlight. Dim lighting can also be dangerous in the middle of the night, so make sure that you have adequate ceiling fixtures. A pendant or chandelier can add a nice design element as well. Bathrooms are small by nature, so they’re a great place to go a little crazy with paint colors since they won’t overwhelm as they might on a larger wall. Try different shades to find something that works for you, and then have fun finding just the right brightly colored bath towels and accessories to coordinate. After all, a bathroom is a private space just for you! Ready for a bathroom redesign or remodel? Call the professionals at Beaverton Plumbing, who can help replumb your new bathroom. 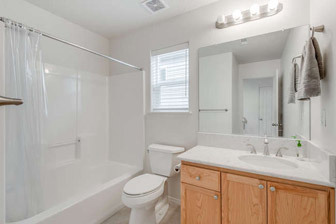 If your project requires a contractor to tear out walls or relocate fixtures, we are experienced in working with other professionals to make sure that the plumbing needs for your bathroom remodel are taken care of right, the first time. Call us today at 503-643-7619.